A seven-bedroomed property achieving an annual rental income of £33,020 is one of the lots going under the hammer at SDL Auctions Cheshire and North Wales’ auction on Thursday 21 February at Chester Racecourse. 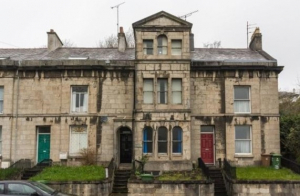 The three-storey, Grade II listed mid-terraced House in Multiple Occupation in Bangor, is among several tenanted properties to be sold in the auction and one of 103 featured in a bumper two-auction catalogue, which covers the Chester Racecourse auction, SDL Auctions North West’s auction in Manchester, as well as online lots. From an investment point of view, the registered HMO, 4 Erw Fair, Garth Road, Bangor, is just minutes from Bangor city centre with its university, wide range of amenities and transport links. The A55 expressway is just a short drive away, allowing easy access to the beautiful Isle of Anglesey, the stunning Snowdonia National Park and the coastal resorts and attractions of North Wales. The property, which has a *guide price of £180,000+, has uPVC double glazing at the back and gas central heating. The ground floor comprises an entrance hall with access to a spacious basement area, a lounge, kitchen, two bedrooms, WC and two showers. There are three bedrooms, a bathroom and WC on the first floor, with two further bedrooms on the second floor. Outside there is a raised forecourt garden at the front, with steps up to the main entrance. At the back of the property is a yard and store with steps leading to a private mature garden. Another tenanted HMO is 5 Victoria Road, Wrexham, which has a potential annual income when fully let of £22,200 and a guide price of £140,000+. One room is vacant at the moment, so the five-bedroomed property currently produces around £18,820 per annum. It is ideally situated for an HMO, being close to hospitals and the Wrexham campus of Bangor University, as well as having good transport links to Chester and North Wales. It is believed the property has gas central heating and UPVC double glazing and features two reception rooms, a kitchen/diner, five bedrooms and a bathroom, with low maintenance gardens front and rear. Elsewhere in Wrexham, 11a Derby Road has four bedrooms and currently produces an annual rental income of £8,340. The mid-terraced property, which has a guide price of £140,000+, has gas central heating and uPVC windows throughout and features four bedrooms, two reception rooms, a kitchen/diner and a bathroom, with low-maintenance gardens front and rear. It is within walking distance of the Eagles Meadow Shopping Centre. As well as these tenanted properties, there are a number of other residential opportunities in the auction, including 29 Sandy Lane, Prestatyn, a three-bedroomed semi-detached property with gas central heating and double glazing. With the heart of Prestatyn and the railway station just a few minutes’ walk away, and within easy reach of the A55 Expressway for commuting to Chester, Manchester and further afield, the property would make both an ideal buy-to-let investment and an excellent family home. It comprises an entrance hallway, living room, open plan kitchen/diner, WC and rear lobby on the ground floor, with three bedrooms and a family bathroom on the first floor. The large front garden is paved to provide off-road parking and the rear garden is mainly lawned, with a useful storage building. Debs added: “The properties in our upcoming auction will appeal to investors large and small, and the fact that so many of them are tenanted means you can start earning an income from them straight away.